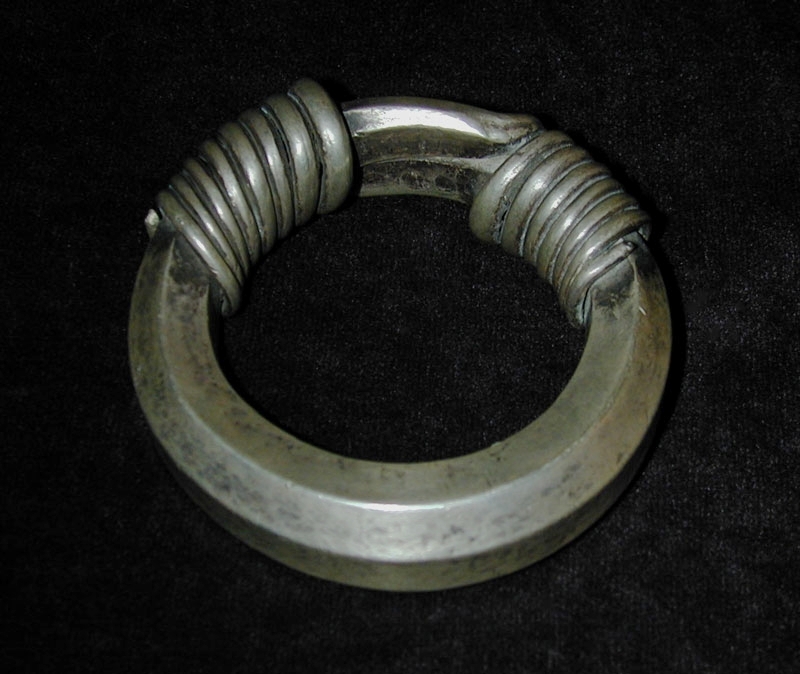 jewelry — CHINALAI TRIBAL ANTIQUES, LTD. Hollow silver Hmong neckpiece, Siam or Laos, circa 1900. Five high quality silver tubular layers give this antique piece a stunningly contemporary look. Pair of silver bracelets, Burma, late 19th century. These high quality solid silver sculptural bracelets culminate in lotus buds, important symbols in Buddhism. Hand-cut irregular but well-matched beads with lovely colors. The variety and intrigue of banded agate is evident in these flat pendant-like beads. Sold separately (3 left). Silver anklet pair, India, turn-of-the-century. Silver neckpiece, China, late 19th century. Two pendants on a hollow neck torque together are a prime example of the fine craftsmanship of antique Han Chinese pendants depicting scenes from legend or mythology. The pendants have traces of gold wash.
Miao silver bracelet pair, China, early 20th century. Early Miao (Hmong) silver jewelry shows a great variety of artistry. Silver bracelet, India, late 19th century. Solid and with fine, graphic detail. Silver neckpiece, Pakistan, early to mid 20th century. With dated coins and glass 'gems' in perfect original condition. Carnelian beads, Afghanistan or Persia, 100 BCE to 200 AD. Silver bracelet pair, Burma, turn-of-the-century. Extremely elongated lotus bud ends make these high quality silver bracelets both collectors' items and weapons, perhaps to frighten away evil spirits. Hill Tribe silver bracelet, Golden Triangle or China, 19th century. High quality solid silver worked into two confronting dragon heads holding, or fighting over, the pearl, symbol of power, energy and wisdom. On custom-made metal base. 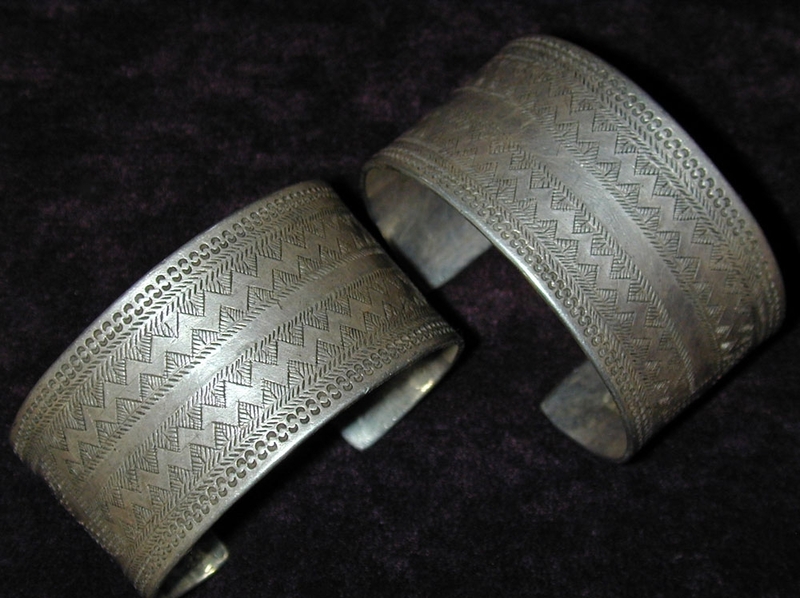 Pair of Akha, Lahu, Lisu or Wa/Lawa silver bracelets, Burma or Siam, turn-of-the-century. Long and rare matching pair of high quality silver spirals. Akha, Lahu or Lisu silver clothing ornaments, Burma or Siam, early 20th century. Separate silver toggles made it possible for these striking disks of high quality silver to be used also as jacket fasteners. On custom-made metal bases. Yi silver earrings, China, early 20th century. Wonderful detail on this pair of Yi earrings from Sichuan Province. Yi silver jewelry is quite rare. 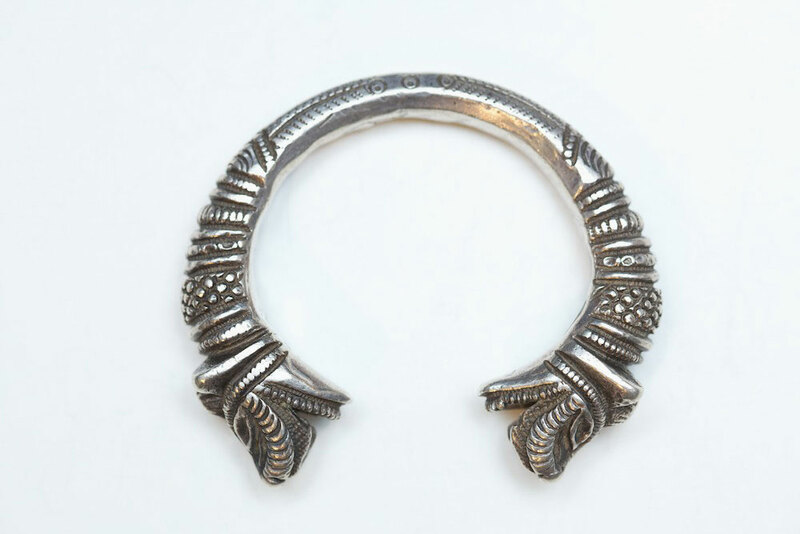 A solid silver bangle with confronting open-mouthed makara heads. 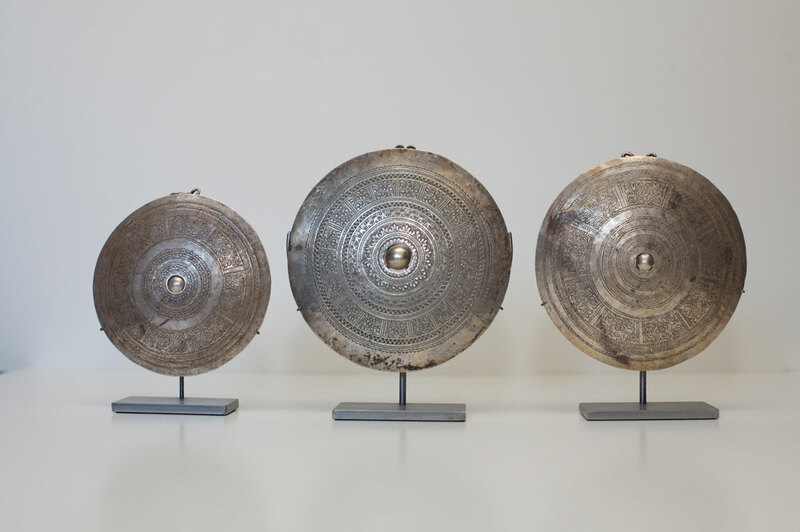 Hmong silver pendants, Siam or Laos, turn-of-the-century. High quality silver pendants like these were worn on silver chains alone or suspended from a silver neck torque and were believed to lock the souls into the body. Old pendants like these from the late 19th to early 20th century are quite rare; the elongated ones even moreso. Silver and turquoise bracelet, Oman, 18th or 19th century. 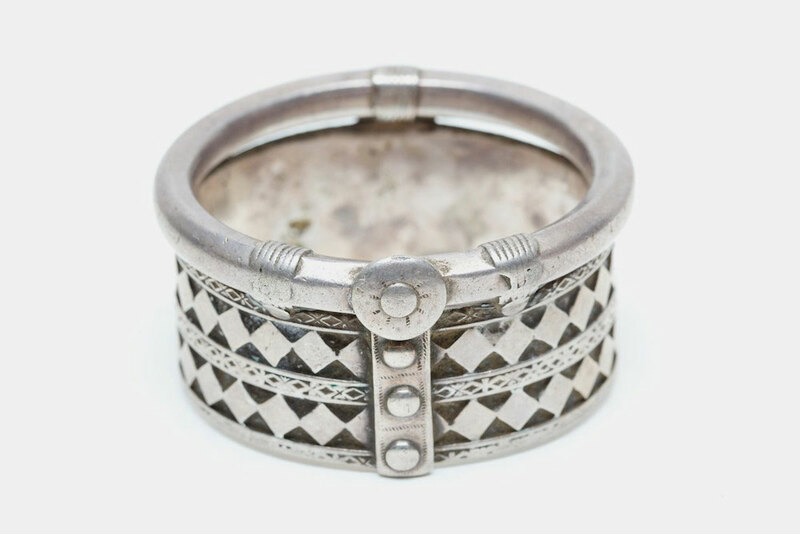 A very old and rare tiny silver Bedouin bracelet that opens with a hinge and pin. Hollow, with fine detail and granulation. Enameled Hill Tribe silver bracelet, China, 19th century. A very old solid high quality silver bracelet, probably Yao, with two confronting dragon heads and enamel highlights. On custom-made metal base. Fine coral, jet, turquoise and mother-of-pearl inlay in silver create lovely detail in this unique 1940s buckle from the American Southwest. Silver pendant, South India, early 20th century. A very unusual large pendant with a central cobra flanked by two deities with human heads and serpentine bodies. Enameled silver fish pendant, Yao or Hmong, South China or northern Siam, 19th century. Similar to a Victorian chatelaine, this finely detailed fish and quite rare fish is suspended from a woven silver chain; and has tools hanging below its body, including miniature tweezers, toothpick and ear spoon. Silver bracelet, Kachin, Burma, 19th century. 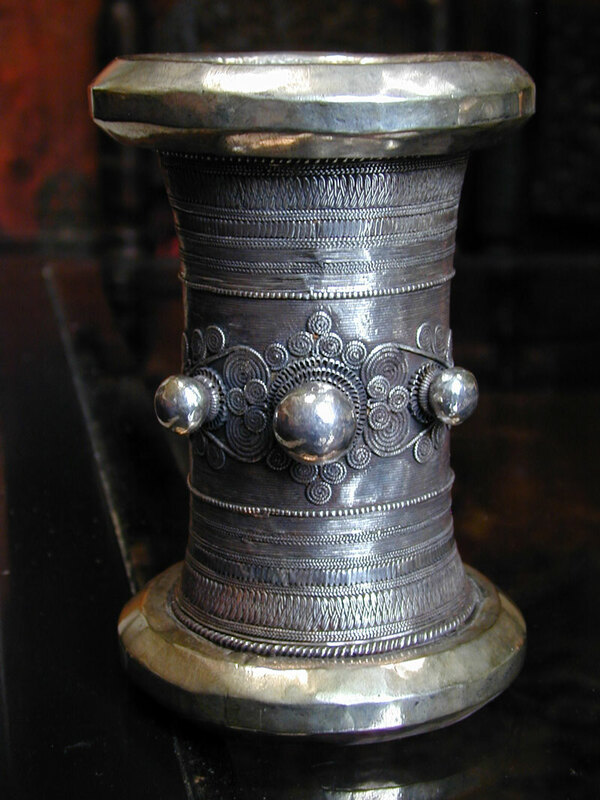 A rare bracelet unique to a remote region of Burma near the Chinese border yet with sophisticated silver craftsmanship in a variety of techniques. Miao silver bracelet, China, 19th century. An unusually large and heavy solid medium quality silver bracelet from the Miao (Hmong) people of Guizhou Province. Hill Tribe silver pendant, Golden Triangle, 19th century. Multi-layered pendants like this might have been worn suspended from a neck torque or clothing down the back or front. The silver is of high quality and the fact that there are no parts missing make this rare large adornment more rare. Of solid silver and excellent workmanship. Pair of Yao or Hmong silver neck torques, Laos, 19th century. 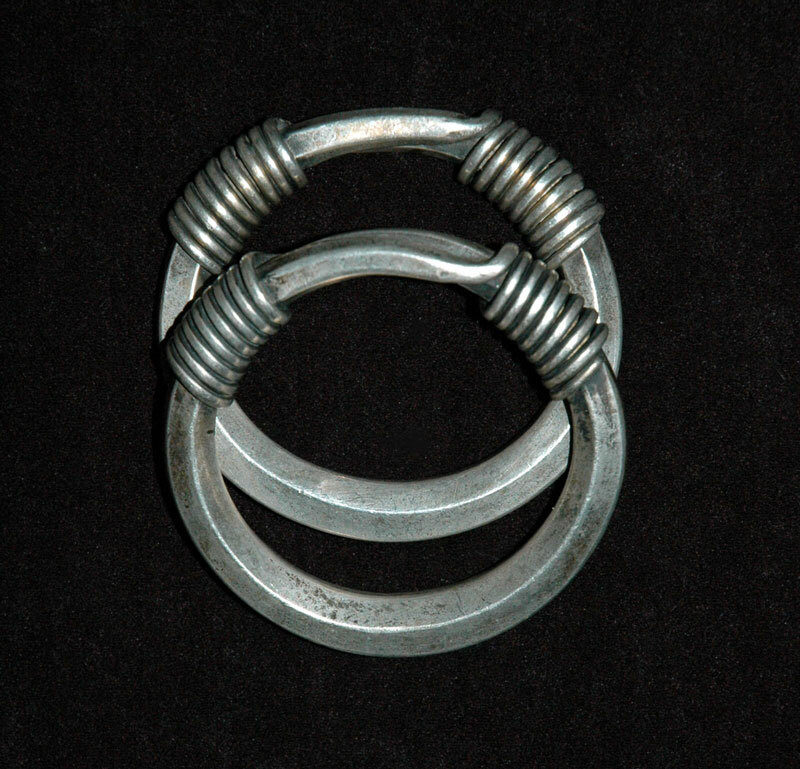 A rare and outstanding matched pair of high quality Hill Tribe silver neck rings from northern Laos. Silver bracelet pair, India, 19th century. Fine craftsmanship gives the worn serpentine bodies of the makara the look and feel of snake skin in this special pair of hollow silver bracelets. Berber silver anklet pair, Morocco, early 20th century. Akha, Lahu or Lisu silver bracelet pair, northern Burma or Siam, early 20th century. A matched pair of high quality silver with full vivid lines. Mien Yao silver wedding necklace, Siam, Laos or China, early 20th century. Detail of a unique style of ceremonial necklace worn in a unique manner, suspended either from the back of the thick ruff of the Mien woman's robe or from the side hooks of a silver neck torque, it is replete with woven chains, beads, rods, dangles and bells making it an auditory as well as visual delight. Since silver was treasured spiritually as well as esthetically, it was relinquished with great reluctance, often causing elaborate necklaces like these to be sold in pieces. Thus not many have been preserved and finding a complete and original one is rare. Reference: Paul and Elaine Lewis, Peoples of the Golden Triangle, p. 58; Jess G. Pourret, THE YAO The Mien and Mun Yao in China, Vietnam, Laos and Thailand, pp. 56 and 153. Wa/Lawa pair of silver bracelets, northern Siam, late 19th century. 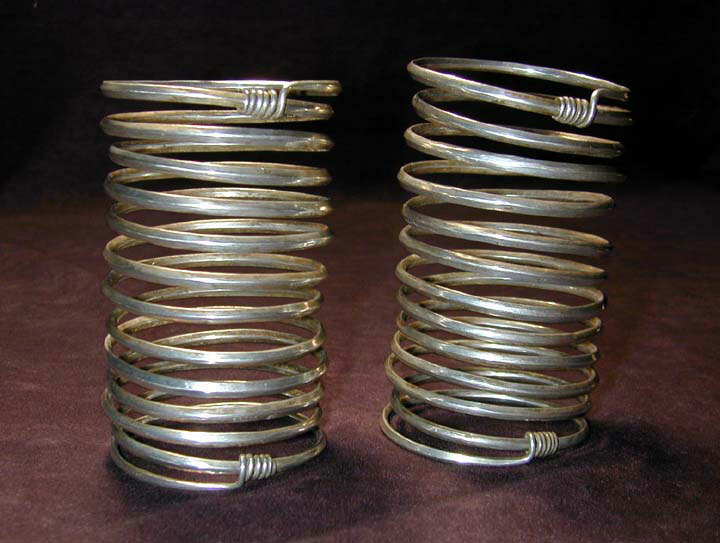 A matched pair of twisted wire bracelets of high quality silver in excellent condition from a group of people indigenous to northern Thailand. 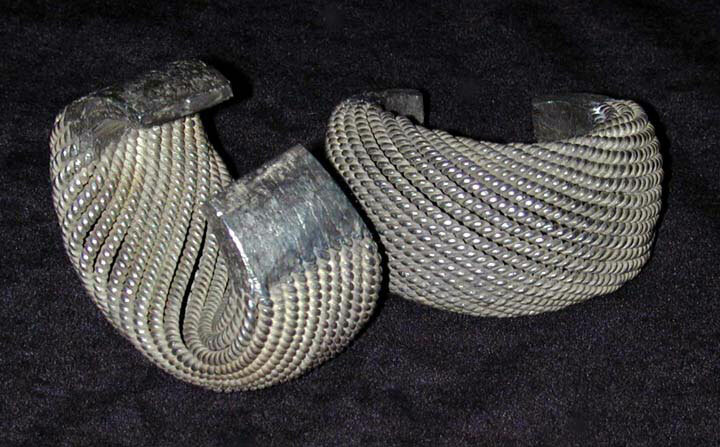 Pair of silver bracelets, India, turn-of-the-century. 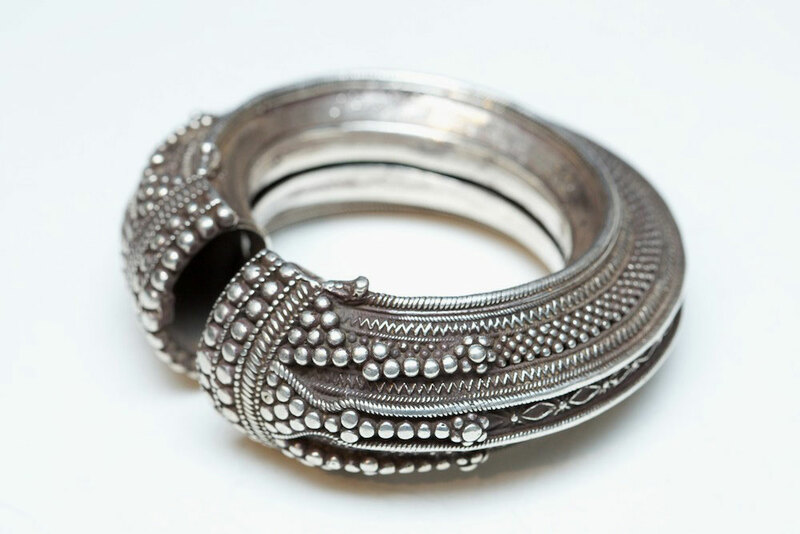 Stunning long pair of silver bracelets from Gujarat or Rajasthan with excellent workmanship, worthy of a collection.